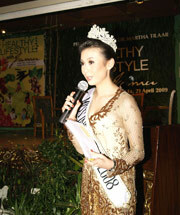 DR. Martha Tilaar celebrates Kartini Day on 21 April 2009. The 72-year-old entrepreneur never ceased to innovate; her work and dedication is invaluable to Indonesia's cultural diversity. 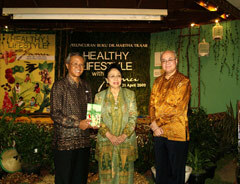 That's Why, DR. Martha Tilaar assisted by the team from Martha Tilaar Innovation Center launched the book entitled Healthy Lifestyle with Jamu: Sehat dan Cantik Alami sesuai Siklus Kehidupan. The book launch is attended by Kusmayanto Kadiman PhD, Minister of Research & Technology, who gave the opening speech. "I learned a lot from Mrs. Martha Tilaar who gave one hundred percent of her love to local products," says Kusmayanto. "And I am happy that jamu, the authentic Indonesian drink, received such a high appreciation and not only positioned for the lower class." 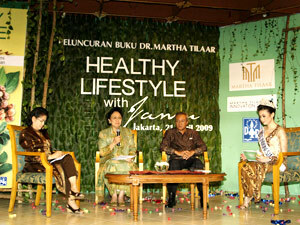 In the book Healthy Lifestyle with Jamu, Dr. Martha Tilaar shares many of her secrets in healthy living and wholesome beauty by relying on the power of herbs. It is based on her own life experience as well as recipes for healthy juices made from a blend of fruits, vegetables, and several types of herbal plants. There are also 25 chosen consumers� stories from the 2007's RISTEK � MTIC Award. 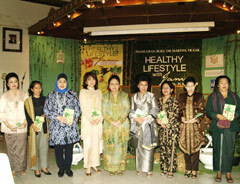 The stories tell their successful personal experiences using herbal plants to care for their health and beauty. Want to know about the short process of turning a plant into a marketable product? The book also covers the know-how of said process. For 39 years, Dr. Martha Tilaar has continuously shared her knowledge for posterity about the diversity of Indonesia's natural resources, with 30,000 plant species, that can be used to make life healthier. The stories also include her trying to conceive a child that eventually leads to the creation of the Wulandari � Sariayu caplet that has been proven successful from consumer�s testimonials. The concept of health and beauty based on the Cycle of Life starting from infancy to old age is also explained thoroughly. Through the auspices of Martha Tilaar Group many jamu-based products has been clinically proven beneficial, such as Lancar Datang Bulan, Paket Habis Bersalin (parem,palis, minyak telon), kaplet selangking singset & susut perut, kaplet jerawat and many others. Having a healthy lifestyle and to be beautiful inside out is actually not that difficult and inexpensive to achieve. Unfortunately, not that many people know how to use their family medicinal plants (TOGA) that grows in their garden. Those herbal plants can be an alternative solution to curing and preventing benign diseases, as well as for beauty purposes. Dr. Martha Tilaar hopes that this book can be widely accepted by society. "Now it's not the time for globalization anymore, but it's glocalization!" she says. "What I mean is that Indonesia has a distinct identity and uniqueness that made it standout in the eyes of the world. The same goes to jamu that is considered exotic by people from many countries. So let us explore and develop the richness of our cultures and natural resources and make glocalization as the identity of Indonesia."